丹麦，哥本哈根，Sølvgade学校/ C.F. Møller Architects - ArchGo! Denmark’s oldest school, the listed Sølvgades School built in 1847, close to King Christian IV’s famous historic naval barracks, Nyboder, in Copenhagen, has for many years been lacking space and modern facilities. 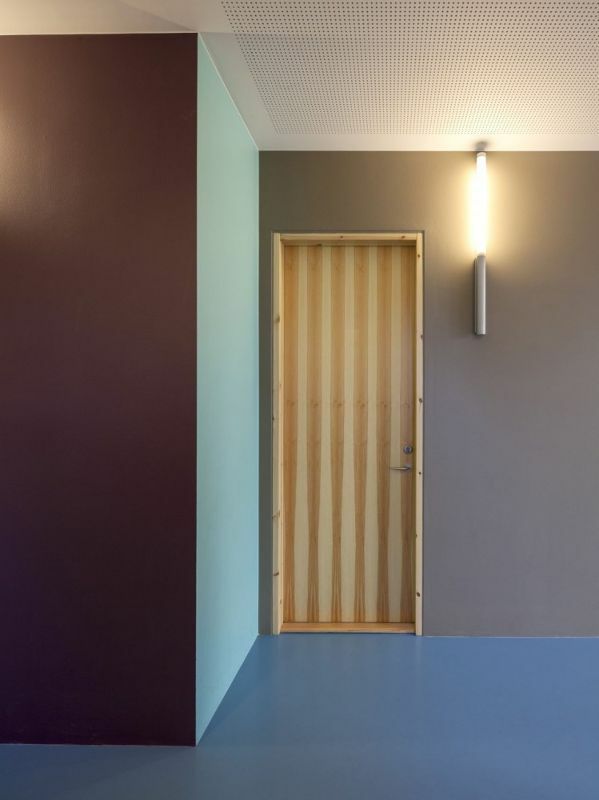 C. F. Møller has carefully renovated the school and done an extension which in its form and colours is true to the surroundings, but also adds a modernistic twist to the school. The new six-storey building with its striking glass façade gives Sølvgade School a lively and dynamic expression, but with its slanted shapes and colour scheme, it also corresponds with the historic surroundings. Inside, the floorplan layout twists and angles, walls are sloping, and the coloristic colour scheme continues, linking inside and outside and creating an inspiring learning environment. The unusual double layering of the façade creates a highly insulated building, minimizes traffic noise, and functions as vent stack for natural ventilation. The hybrid ventilation concept combines natural and mechanical ventilation to minimize the use of energy and create the optimal indoor climate crucial to a learning environment. All in all, the energy consumption does not exceed 68 kWh/m2/year. All in all the school is a good neighbour. Considering not only its own natural lighting needs, the building preserves the light for surrounding buildings. This thoughtfulness continues through the rest of its form. While maintaining its modern sensibilities, the building borrows colours, proportions and references from the historic surroundings. The structure respects existing patterns by changing rooflines to connect a historic side street building to façades on the other side of the block.